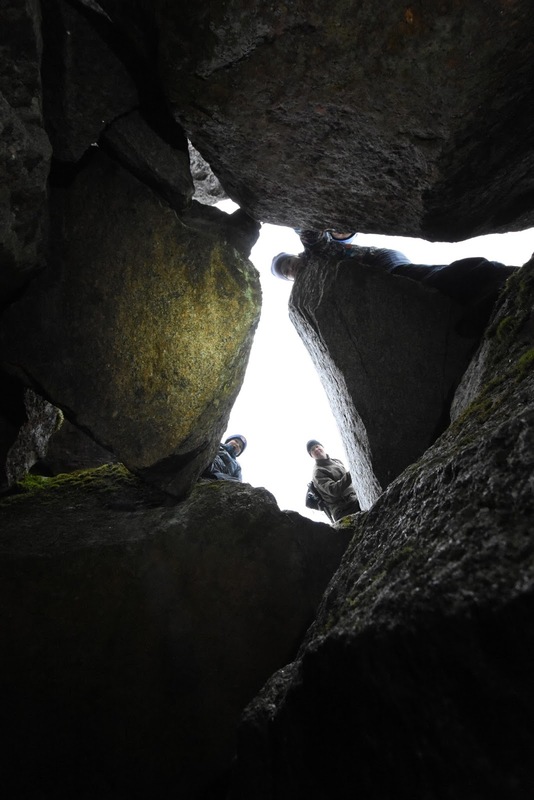 Imagine rocks thrown together, all sizes all the way up to house-sized boulders. Korkberget doesn't get more than a brief mention in "Caves of Finland". 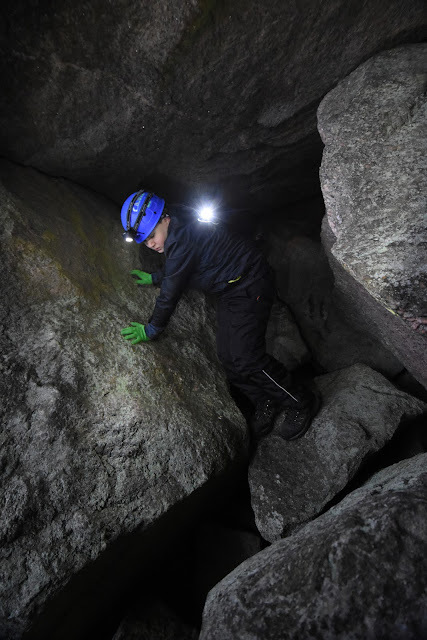 But it is one of the biggest caves in our area, and quite a maze. 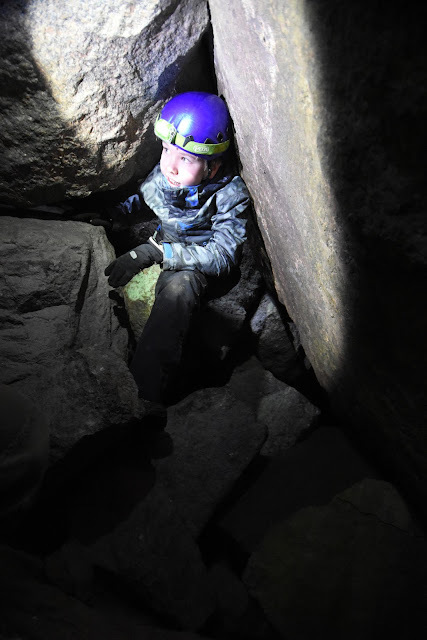 We gathered a crew of experienced and eager cavers (mostly consisting of 11 to 13 year olds) and headed out to explore. The caves are near the waterline, under a big boulder field fallen from a cliff that stands above. 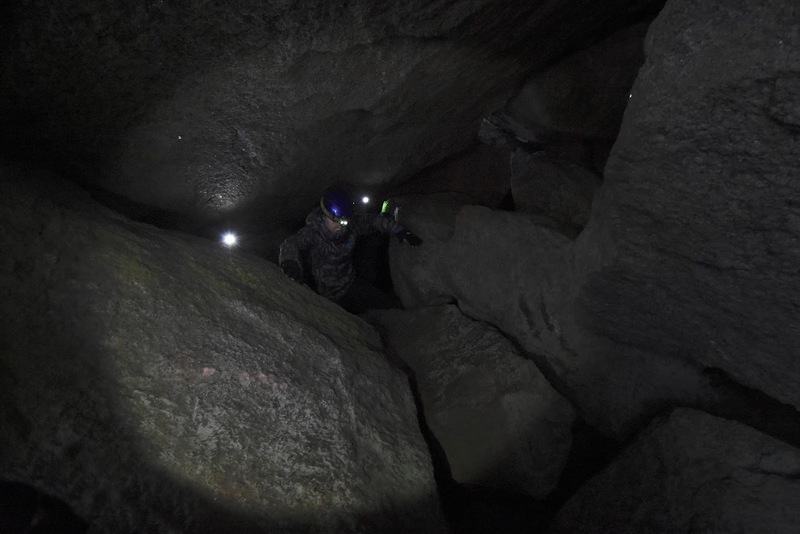 The boulder field caves feel different. 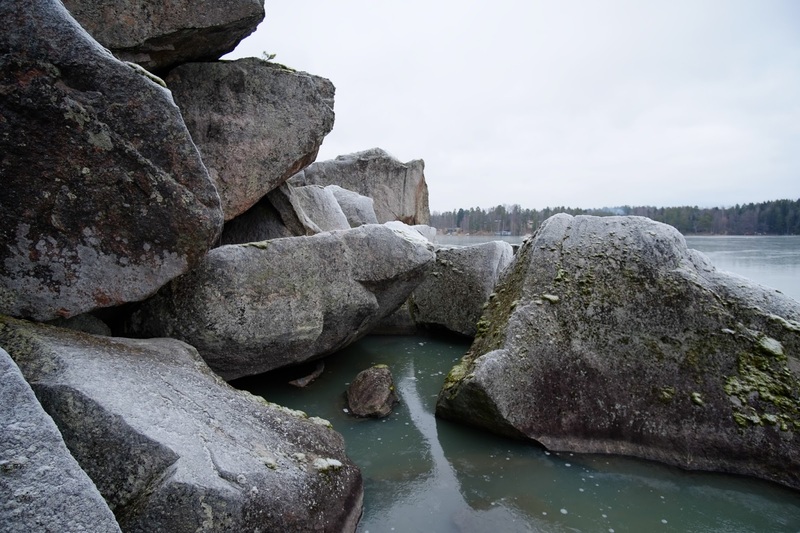 Not carved into smooth shapes by water, not cracked open by forces of nature. They just are, and there is space between them. 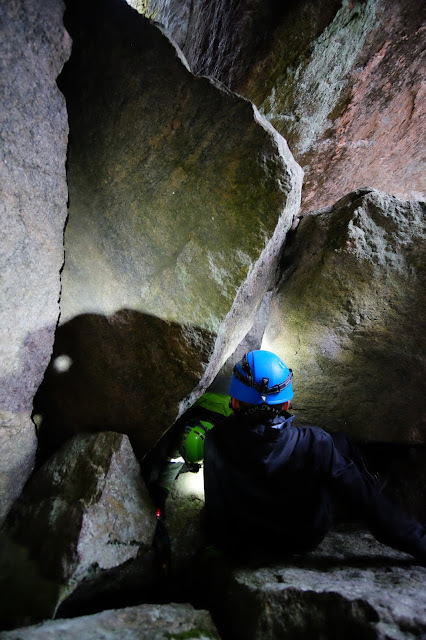 If there's enough big rocks, there will be spaces underneath, and you can crawl around. And there were narrow paths going in two directions. One through a very narrow crack, one that I didn't even try to pass through but maybe somebody could. Another one towards the cliff, seemingly ending in a meter or two. Except that it didn't. If you crawl through you will see that it turns up to at least two rooms big enough for a person to turn around in, or even stand. And then it seemed to stop, but there were so many holes that I am not sure if I didn't miss a continuation somewhere. 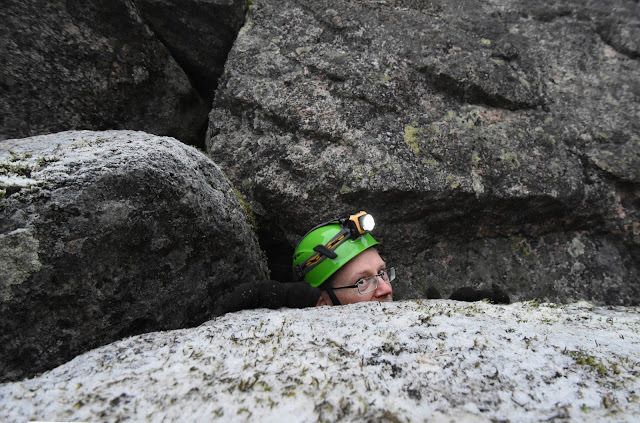 And then thing being five meters below in a tight pile of rocks was that the smaller rocks sometimes moved. This was not building up my confidence, though I suppose the big boulders have been where they are for thousands of years. 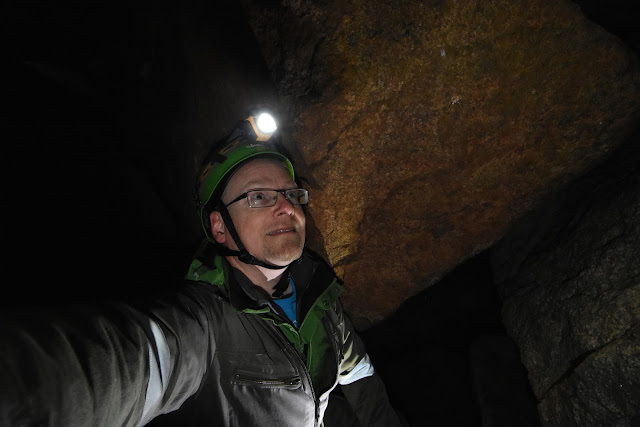 While I explored the hole, Jarmo found the main cave. It is possible to enter the main cave from the hole, I think, by crawling under one of the rocks near the surface. 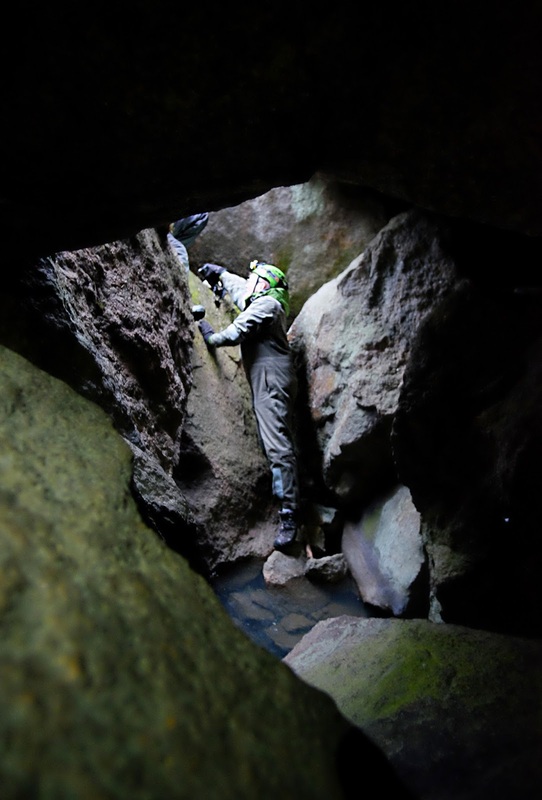 Although I chose to exit and then re-enter, as the crawling space would have been quite tight and had sharp edges. 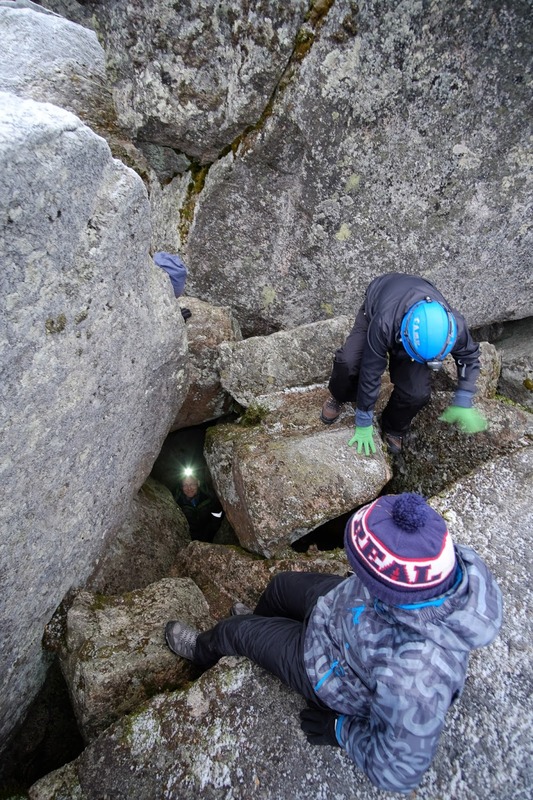 The smaller cave explorers had already gone in. 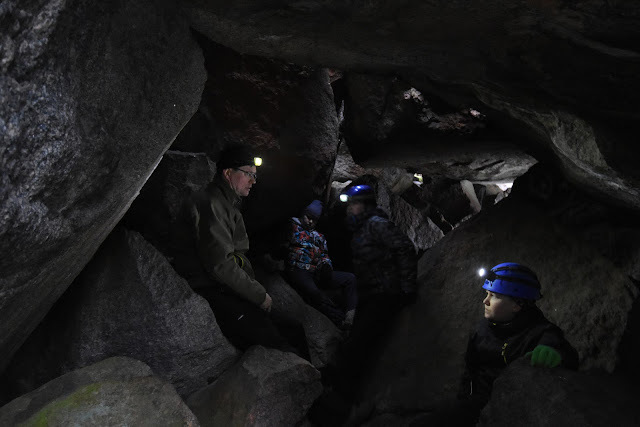 The main cave has a big space - lets call it the dining room because we ate there. Adjoining to the dining room there is a small pool room. The heating isn't all that great in this apartment, though, so the pool was in solid state currently. There are a couple of nice balconies overlooking the lake as well. Going further back, there are a couple of different exits from the cave, and some more rooms. 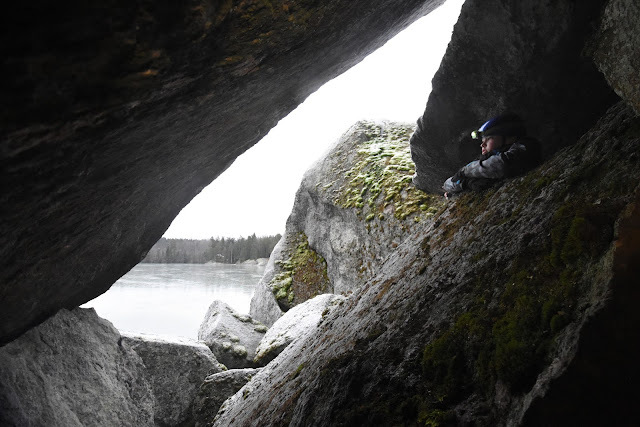 Janne found a small crawlable tunnel on the back side, leading towards the water level. A small room at the end of this tunnel was big enough for two people, and again there were many small openings but we didn't think it was possible to continue further. The cliff tower above the boulder field, including a major overhang, a small "arch" cave, and somebody's hastily constructed little hut. 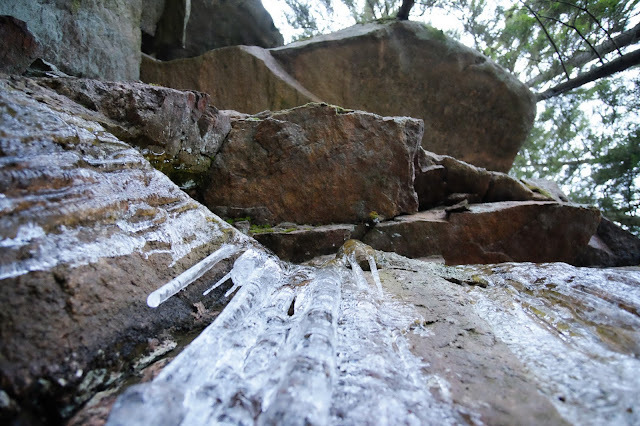 Water flows from the cliff, and had created frozen ice. The cliff, and perhaps later in the winter, the ice looks very climbable, though I'm not sure if it is allowed in this area. 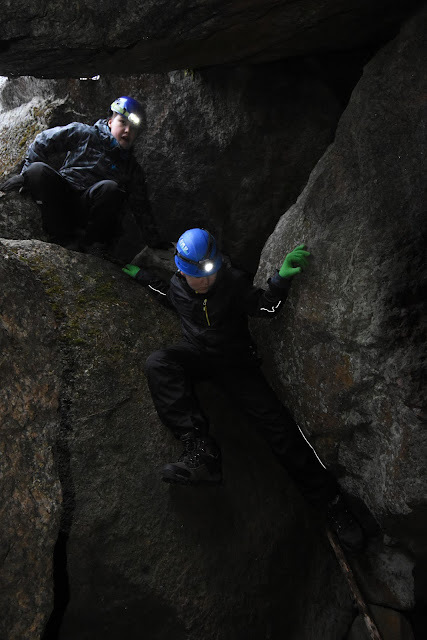 The cave is at the coordinates N 60°9' 43.332'' E 24° 27' 10.733'', and there's about a mile to walk from the road. You can leave the car on the Kirkkotie, though there is space only for one or two cars near the trailhead. 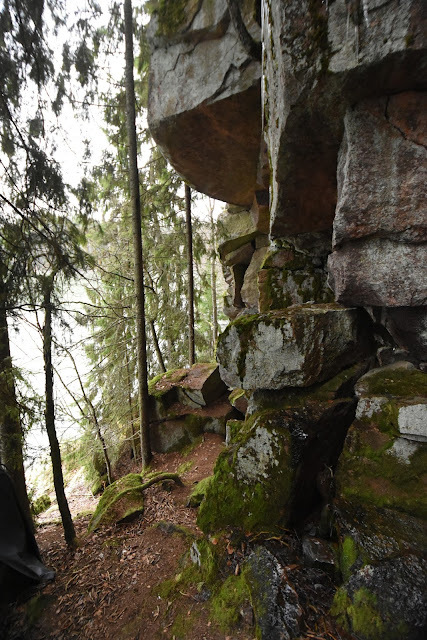 Pictures and videos (c) 2015 by Jari Arkko and Jarmo Ruuth. This blog is also available at the TGR site. Tämä blogi löytyy myös suomeksi.